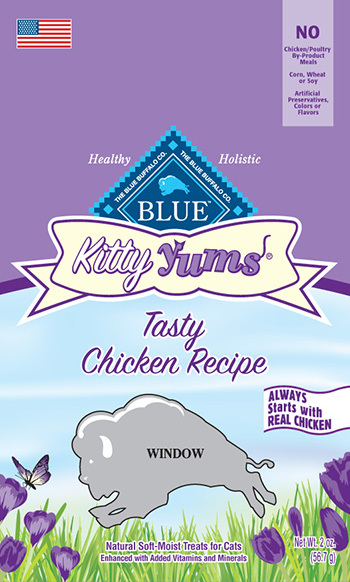 Blue Kitty Yums Tasty Chicken Recipe, UPC: 859610007820 – Best If Used By: April 24, 2016. 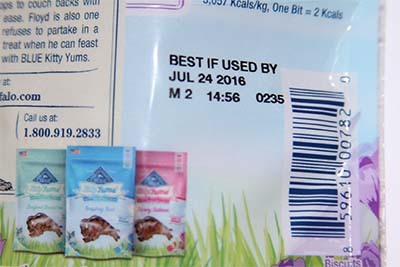 Blue Kitty Yums Tasty Chicken Recipe, UPC: 859610007820 – Best If Used By: July 24, 2016. Puperoni also contains Propylene Glycol, why is it still on the market. I quit giving my dogs Puperoni bacause of this. Propylene Glycol is in everything, including processed “people-foods”. The fact that they have to recall cat treats for having a small amount is very telling. Why is poison being permitted in food? Basically anything processed should be considered toxic and avoided at all cost. I’ve always sort of felt that way, but it didn’t really sink in until I discovered there was TSP (TriSodium Phosphate- a commercial grade detergent that’s considered TOXIC) in my breakfast cereal, right there on the ingredient label for anyone to read. Our FDA is such a joke. Do yourself and your pets a favor, ditch the boxed and bagged foods and eat fresh, whole foods. I did this years ago and my family and my dogs are so much healthier (plus the food tastes way better!). INSTINCT also makes Cat foods with excellent ingredients and variety – Kibble, canned, freeze dried and Raw Frozen. WERUVA wet cat foods which are made from human grade ingredients and available locally or at Chewy http://www.chewy.com/s/weruva?gclid=CLu5l5X8g8kCFUlrfgodd9wDqA. I too, have been using Orijen Kibble for quite some time because I believe the free range ingredients from Canada are the very best out there. I was extremely disappointed to know that they are building a plant in a small town in Kentucky to open next year in 2016. A town which is low income and has even had water toxicity issues in the past no less. For every one free range family farm there is probably six run of the mill factory farms in the outlying communities. The fact that they would not add their name to the Susan Thixton pledge on the Truth About Pet Food site never really bothered me. But since it is a pledge to be complete and openly honest about where each and every one of their ingredients originate I am now having my doubts since finding out about their plan to open a manufacturing plant in Kentucky next year. They boast of receiving fresh fish and free range meats daily from the surrounding areas of Canada. I have not minded the exorbitant price simply because of the quality of the food. I do not see how I can continue to pay such a premium price for food grown in the U.S. where factory farms abound and I can not be absolutely sure of where the beef or the turkey or other ingredients are raised. (Where are they going to get the free range raised venison and boar in the Regional variety and the type of fresh fish they are using now anyway?). A huge disappointment to me to have to go back to searching for a cat food kibble affordable and high quality enough for my several cats next year. I’m sure it’s for the sake of profits having a plant in the U.S. but at what price for our animals? When this comes into effect next year I will no longer be able to trust Champion Pet Foods as I have done in the past. Hi Phyllis, I don’t have cats anymore, but I had been preparing homemade food for my brothers cats for around three years with great success. Switching from the bottom of the line grocery brand kibble (Purina Cat Chow to name names), we began cooking large batches of chicken leg quarters, (higher in taurine than most meats) and cutting it 50/50 by weight with cooked potato. A food processor works great for blending them up so they can’t pick out the meat, but chill the potatoes in the refrigerator first or it will get too pasty. You will have to add 1) fish oil, and 2) egg shell powder for calcium (1 tsp per lb of meat). Some people might argue this wasn’t balanced but the cats still did WAY better than on kibble, sleeking out and no more matted hair, diarrhea, or fur balls. What I’ve learned since is that the recipe was lacking in vitamins and minerals, so I’d def. add in organ meats, especially hearts (also high in taurine), and/or a cat multi vitamin/mineral supplement. An even better option would be a raw diet (http://feline-nutrition.org/ has great info about making raw cat food) but some cats are so picky they wont eat it, and cooked real meat is still infinitely better than commercial cat “food”. I haven’t read it myself, but Susan has a recipe book for pets you could check out as well. Based on her articles here on the website I’m sure its very informative- http://www.amazon.com/Dinner-PAWsible-Cookbook-Nutritious-Homemade/dp/1632206749/ref=sr_1_2?s=books&ie=UTF8&qid=1430580567&sr=1-2&keywords=dinner+pawsible Another great source for info & recipes is Dr. Pitcairn’s Complete Guide to Natural Health for Dogs & Cats. Thank you all for leaving these comments. Well appreciate the dialogue. I eat a predominance of organic and I want the best for my babies as well. Blue Buffalo killed our dog (she was less than 2 years old); when they held off a recall for 3 months. She dies of hypercalcemia, from excessive vitamin D; which resulted in organ failure. As proof (veterinary test results aside) they wanted labels from the bags of food we had bought — Who holds on to empty bags of dog food?! I am so sorry to hear about this. My sincerest condolences. How simply awful. I’m so sorry to hear of your loss! My cat had been diagnosed with hypercalcemia back in Feb. and what had she been eating?–BLUE BUFFALO! Luckily we discovered it in time and switched foods.. I’m so disgusted with Blue Buffalo, especially hearing about all of the rave reviews on different websites. Plus they were recently sued by another popular brand of pet food (I think it was Purina), because they didn’t disclose all of the ingredients, and basically lied about their foods. I’m not sure I trust any pet foods. I was impressed with Nature’s Logic, because they don’t add synthetic vitamins and minerals, but unfortunately, my kitty did not like it, even mixing it with other foods. I’ve just recently purchased Susan’s book, Dinner Pawsible and I’m planning to try the recipes. I’m just praying she will like the food, since she’s so finicky! Last question (maybe- I like to pick brains on cat food), has anyone heard of Life’s Abundance? It seems like a good company, but I haven’t heard Susan recommend it. I have been using the dry food for quite some time until I had to feed my one kitty SO for a urinary problem. Now both cats won’t go back to the Life’s Abundance dry. The moist is organic, but I haven’t been able to get them to eat that for awhile anyway. I was trying to switch them to Hounds and Gatos recently and then she got cystitis and everything changed. Any other suggestions besides cooking their meals (and no they won’t eat raw either). Yes, why ARE poisons being permitted in some pet foods??!!! I don’t know if ETHYLENEDIAMINE DIHYDROCHLORIDE, is in any cat foods, as I only have dogs, (now only have 1 of 2 still alive since September of this year) but I found this “preservative” was found in a canned dog food, PURE VITA, of which I was assured by the retailer, that it was a great dog food. He reacted to this “poison” by constant itching and scratching. By researching it online, Ethylenediamine Dihydrochloride is a substance that is used to manufacture various drugs and industrial compounds. It is a colorless liquid that is also used as a preservative, emulsifier, and stabilizer in certain medical creams, cosmetics, and a variety of other products, such as, bleach activators, lubricants and waxes, and binders for printing inks. You may be exposed to Ethylenediamine Dihydrochloride through products such as solvents, textile resins, inhibitors, anti-freezers, epoxy hardeners and coolant oils. Water-based industrial products may contain Ethylenediamine Dihydrochloride as a fungicide. At home, you probably won’t find Ethylenediamine Dihydrochloride, even though it has been used as a starting material to produce many drugs, laundry additives, fungicides, and cured epoxy products. I’m already fighting for my Kobie’s life now, as he has some type of Liver problems now due to the extra copper the manufacturers are putting in ALL of the dog foods for whatever reason, and has become allergic to pork and corn, and is borderline allergic to beef, rice, and a few other foods. So why can’t they use Vitamin E as a preservative or some other “unpoisonus” product?